If you are a fan of iOS devices, you probably know there are many unexpected incidents, which may lead to data loss on your iPhone. For instances, iPhone stolen or damage, accidental deletion, reset, virus attack, jailbreak, or error operations. These circumstances may be nightmares to many users, especially who usually save important business info in their phones for convenience. For that reason, this article will give you some suggestions on choosing effective iPhone data recovery program to safely retrieve all lost data. Textes: Contacts, Messages, Call Log, Calendar, Notes, Reminder, Safari Bookmark, WhatsApp, App Document. Media: Camera Roll, Photo Library, Photo Stream, Voice Memos, Messages Attachments, VoiceMail, WhatsApp Attachments, App Photos, App Videos, App Audio. 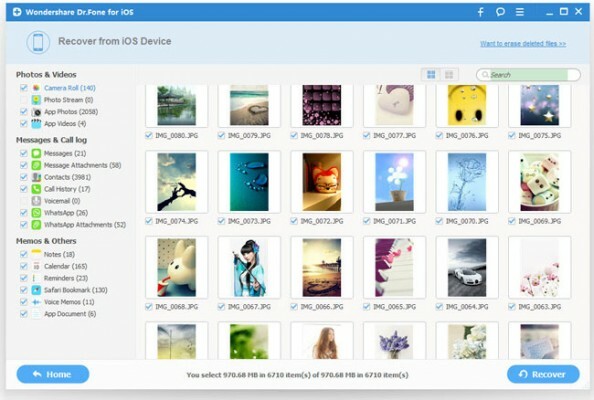 Be able to restore data (up to 19 types) created on iOS devices. Rescue lost data from broken iOS devices. 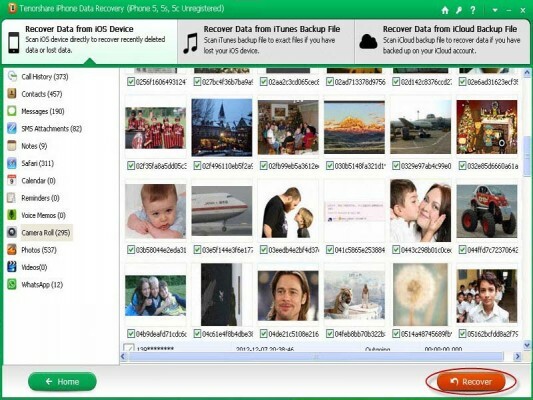 Rescue deleted files from iPhone 4/3GS, iPad 1 and iPod Touch 4. 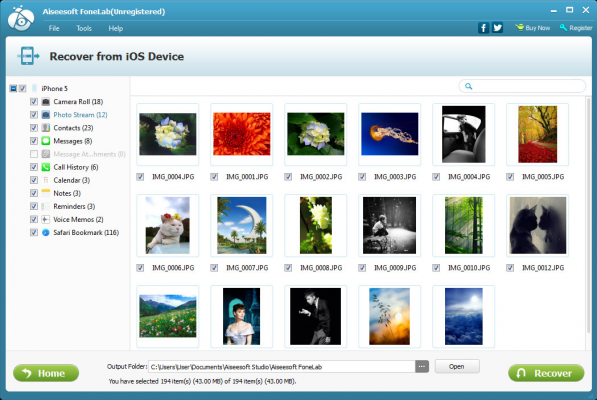 Offers the ability to preview backup data before retrieving. 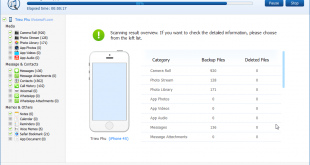 Get back data from your iTunes backup. Aiseesoft FoneLab possesses a simple, straightforward interface and an outstandingly fast scanning and data recovery speed. It rescued my iPhone data effectively, including WhatsApp messages and file attachments. This program is available for both Windows and Mac users at $79.95. There’s a 15-day-trial version for you to try out, but it’s basically useless since the main recovery feature is disabled. If you’re really seeking for this type of software, then Aiseesoft FoneLab is well worth the price. Texts: Messages, Call History, Contacts, Reminders, Calendar, iMessages, Notes, WhatsApp History, Safari Bookmarks, App Documents. 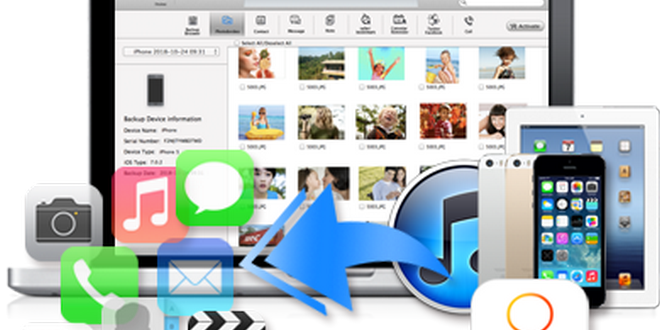 Media: Photo and Video, Voice Memo, App Photo, Photo Library, Photo Stream, VoiceMail, App Videos. Compatible with many iOS devices. Support a wide range of data files. Capable of retrieving almost all lost data quickly and safely. Let you preview before recovery. Fix the operation system of iOS devices (this process approximately takes 10 mins). Professional yet friendly-user interface, suitable for all types of users. 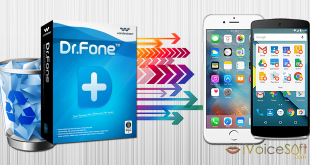 Wondershare Dr. Fone for iOS is a very good app when it comes to recovering your gone data. Even though it didn’t retrieve all my deleted files, but I have to say that it came close to what I had expected and I was pretty satisfied with the program’s fast-scanning speed. It has both versions for Windows and Mac OS. 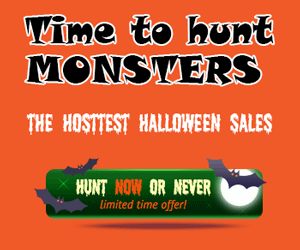 iPhone 6/6 Plus, iPhone 5S/5C/5, iPhone 4s, iPhone 4, iPhone 3gs, iPhone 3G and lower versions. Texts: Call History, Contacts, Messages, Safari, Calendar, Reminders, Notes, WhatsApp, Tango, Viber Call, App Document. Media: SMS attachments, Voice Memo, Camera Roll, other Photos, Voicemail, WhatsApp Attachments, Viber Messages. Provide 3 recovery ways to help you retrieve data back (from iOS devices, from iTunes Backup File, and from iCloud Backup File). Support recovering up to 15 file types. Support preview data before recovery process. 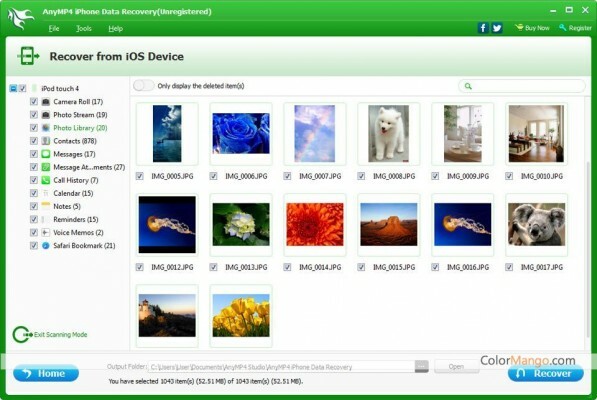 Tenorshare iPhone Data Recovery enables you to recover deleted/lost data from your crashed iPhone. The program supports a wide range of data, including WhatsApp data recovery. However, this program doesn’t launch if you don’t have iTunes installed on your computer. In addition, it is quite specific that this recovery app only works best with iPhone 5, while other data recovery programs can work with various iPhone versions. iPhone 4, iPhone 3GS, iPhone 6/6 Plus, iPhone 5S/5C/5/4S. Media: Camera Roll, Photo Library, Photo Stream, Message attachments, Voice memos, WhatsApp Attachments, Voicemail, App Photos, App Videos, App Audio. 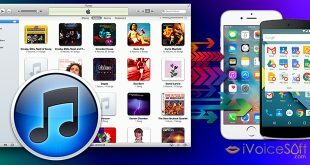 Provide 2 smart recovery modes: Recover from iOS device and from iTunes backup. Support a wide range of data types, as well as iOS devices. Fully compatible with iOS 8. Allow preview current files and deleted files before recovery. 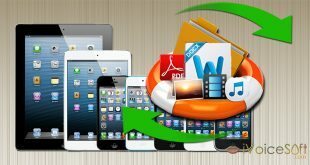 AnyMP4 iPhone Data Recovery is an easy-to-use program for both Windows and Mac users who manage their files on portable devices, especially iOS ones. The program works pretty good as scanning files and recovering almost all my lost data. However, recovering process takes a bit longer than I expected. Texts: Messages, Contacts, Call Log, Safari Bookmarks, Reminders, Calendar, Notes. Media: Camera Rolls, Videos, Photos, Voice Memos, Twiter/Facebook data. Offers 2 recovery modes: from iOS devices, and from iTunes backup. 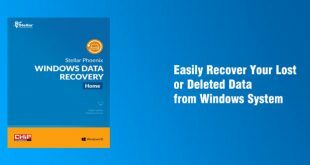 Support recovering up to 12 types of lost/deleted files. Provide a quick and outstanding scanning kernel to restore all data safely from your devices. Allow you to select files before recovery. User-friendly interface and illustrated images guide. Fully compatible with iOS8 and the latest iPhonê/Plus, iPad Air, iPad Mini. Specialized for Mac OS only. 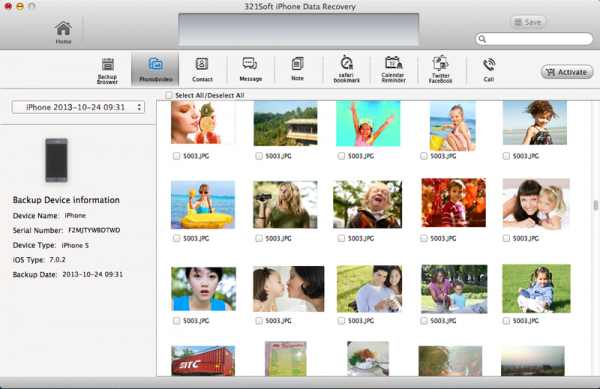 321Soft Mac iPhone Data Recover does a great job at recovering various types of lost data from our iOS devices or iTunes backup. Despite of having similar features to other iPhone Data Recovery apps, I was impressed by how smooth and intuitive it was during the test. Have you made your own decision yet? Freely let us know by leaving your opinion in below comment box.